I apologise in advance, the diagram to the right is for a far more modern petrol engine. Before New Year I ran a competition over on Poets' Graves where the idea was to "Adopt a false persona for Christmas" — all the competitors entered anonymously and submitted one or more poems under a pseudonym. We then had everybody vote for the best poems and best personae; and also a side-competition for people to try and unmask the perpetrators. So... this was one of my entries, written under the persona of "Mr Three Eighths," who is a vintage machinery enthusiast and only slightly modelled on a guy I knew at school. This is a sonnet. Sonnets seem to be my favourite form when I write a formal poem. No idea why this is; except they are the most wonderfully compact, deep and rounded form. I far more often start to write a free verse poem and subsequently discover it is a sonnet, compared to the other way around. In case you are interested, I came third in the competition. You can check out all the entries here, at least until we clear that forum out ready for another competition. it also has chain drive. Bring it alive! the handle-- Ho! Who'd want a Fowler P? 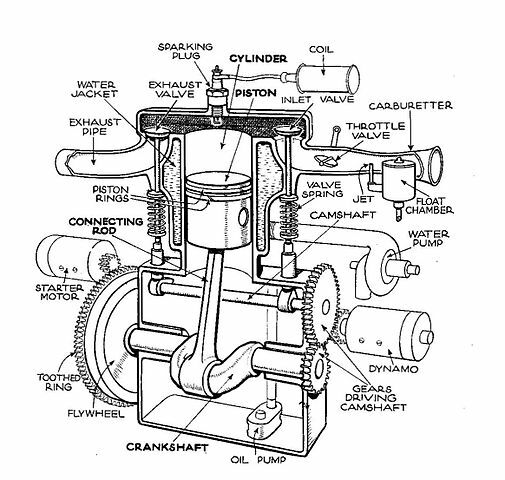 Image attribution: "Single-cylinder T-head engine (Autocar Handbook, 13th ed, 1935)" by Andy Dingley (scanner) - Scan from The Autocar (Thirteenth edition, circa 1935) Autocar Handbook, London: Iliffe & Sons.. Licensed under Public Domain via Wikimedia Commons. First public sighting -- early signs of success!